Range, equity, maximize (REM) is an incredibly effective process for evaluating situations and getting the most from every hand you play. 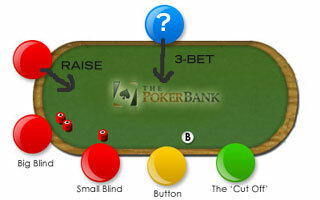 The REM process forms the groundwork of optimum play in no limit Texas Hold'em. The REM process was first introduced by Flynn, Mehta and Miller in the book Professional No-Limit Hold'em: Volume I (the same book that introduces SPR). This article will be split up in to 3 sections, covering the basics of the REM process to make it as easy as possible for you to pick it up and incorporate it in to your game. What is the REM process? As mentioned, REM stands for Range, Equity, Maximize. Range: Assign a range of hands to your opponent based on their play up to that point. Equity: Work out how much equity you have in the hand against your opponent's range. Maximize: Make the most +EV possible play based on the information you have gathered. This is a 3-step process for making the most +EV play possible in each hand you are involved with. Range - Give your opponent a range of hands. Assign a range of hands to your opponent based on their play up to that point and your knowledge of their playing style. Let's get things straight. We're not going to be able to put our opponent on two exact cards judging by the way they have raised preflop and checked to us on the flop. In fact, it's exceptionally unlikely that even the best players in the world would be able to assign an exact hand to an opponent by the river. It's just not possible to be that precise when it comes to hand reading. Use our knowledge of the opponent to help us form a range of hands. 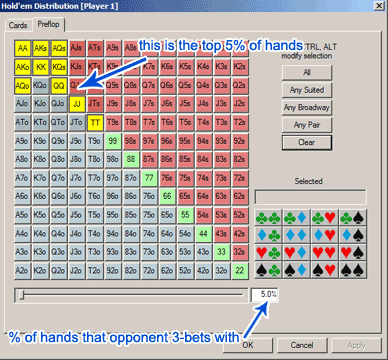 Use poker tracking software stats to give us a more exact range of hands to assign to them. Assigning hand ranges without using software. If you do not have the luxury of being able to use tracking software, you are going to have to draw your own conclusions based on your knowledge of your opponent; more specifically on their style of play and how they have been playing their hand so far. Note: Remember this example, as it will follow on through the rest of the article. A tight-aggressive player makes a 3-bet against an early position raiser (who is an average player) in a 6max game before the flop. A 3bet from early position is almost always a sign of great strength. Hand range for a 3-bet in middle position for our tight aggressive opponent. This is a pretty safe assumption for this example, but assigning a hand range is not always going to be this easy. The less information we have on our opponent, the wider the hand range should be. Assigning hand ranges using software. If we are using a HUD with stats (like the ones that come with Poker Tracker 3 and Holdem Manager) on our opponent, it makes assigning a range a whole lot easier and removes some guesswork from the process, which makes the range more accurate. Lets use the same example as above with the early raiser and mid position 3-bettor. However, the difference is we have a good set of stats on the 3-bettor and it turns out that they are a little looser than we thought. Our HUD stats show that the 3-bettor makes a 3-bet preflop 5% of the time. Therefore, they are making a 3-bet with the top 5% of hands they are dealt. PokerStove isn't only useful for it's equity calculations y'know. Preflop 3-betting range of 5%. So that's all pocket pairs of TT and higher, along with KQs and any AK or AQ. Easy. This is obviously a rough example, but it just goes to show how much more accurate you can be when it comes to assigning hand ranges if you are using tracking software like HoldemManager and PokerStove. 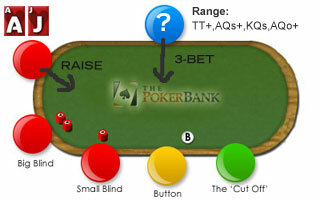 Read more about assigning hand ranges and using PokerStove in the REM Process - Range article. Equity - Find out your equity. Work out how much equity you have in the hand against your opponent's range. Basically find out where we stand and assess the situation. What's our % equity in the hand compared to the range we have just assigned to our opponent? This is where the PokerStove program comes in really handy. You can figure out your equity in the hand without PokerStove, but it requires a bunch of mathematics and so I'm not going to bother going down that route for now. PokerStove makes it easier for the both of us. So what do we do? We put our hand and our opponent's range in to PokerStove and hit "evaluate". It's as easy as that. Let's say that we are actually the initial raiser holding A J and our opponent is the 3 bettor with the range of TT+, AQs+, KQs ,AQo+. Same 3bet situation as before but with our hand and opponent's range added. AhJh's equity against villain's 3betting range. As we can see, we have 34% equity in the hand against this range, which isn't great. This means that our opponent is a 2 to 1 favourite to win at this stage of the hand (see the conversion odds chart or use the hoRatio odds converter program if you're having trouble converting percentage odds in to ratio odds and vice versa). Read more about calculating equity and using PokerStove in the REM Process - Equity article. Maximize - make the best play possible. Make the most +EV possible play based on the information you have gathered. Maximize value. In the following two examples, I will carry on the example with the raise from EP and 3-bet from MP as outlined in the Range and Equity sections. Note: Both players have full stacks. In this example, we are playing $100NL and we both have full stacks. We raised to $7 and our opponents 3-bets to $24. Seeing as our opponent's hand range is much better than our's for the most part, the most "profitable" play for us is to fold. The best that we can hope for is to hit a Jack on the flop. Even then we might not even be in the best of shape, so the best plan of action is to fold as opposed to risking more money with such poor equity in the hand. The most influential reason behind folding here though is our opponent's superior hand range. Note: Opponent has a 20BB stack. We are again playing $100NL, however, our opponent only has $20 left in their stack. We raise to $7 and our opponent 3-bets all-in to $20. We now have to call $13 to win a $28.5 pot ($20 + $7 + the SB and BB), giving us pot odds of 2.2 to 1. Right now we have 33% equity, which works out as 2 to 1 odds. Seeing as our pot odds are greater than the odds of winning, it is marginally profitable for us to make this call. We do not have to worry about playing the rest of the hand as our opponent is all in and we will not have to face any more bets. In this situation, calling the all-in 3-bet is the most profitable play based on our equity in the hand. Remember that this is just one example of an almost endless number of different situations you can find yourself in. Maximizing value takes a lot of experience and knowledge of the game. It is going to be something that you will find yourself working to improve throughout your poker career. 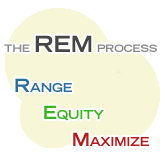 Read more about maximizing value from your hands in the REM Process - Maximize article. Evaluation of the REM process. The REM process is undoubtedly the best possible framework for playing a hand in no limit Texas Hold'em. The hard part is developing the skills to be able to read hands, quickly work out equity and then make the best play possible based on that information. That's where all the other strategy on this site is going to come in handy. You're not going to be able to calculate all the fine details in the middle of a hand, so don't expect yourself to be able to. What you can expect to do is familiarise yourself with the process and try your best to apply the steps to every hand you play, albeit in a much tighter space of time. The more you work with the REM process the easier you will find it to fly through the Range - Equity - Maximize steps before making your decision. The more proficient you get with it, the more bb/100 hands you will be adding to your win rate.